Door Step School (DSS) has completed 25 years in the service of education to street and slum children. While most education-based NGOs work in municipal schools, the uniqueness of DSS is that their program is implemented directly in the slum communities, and education is imparted in local languages. DSS currently works with 85,000 children, and plans to reach out to 15-20% more in the near future. The broader goals of DSS include designing a life skills program for their alumni, and increasing Government support to the program. DSS has been honoured with several awards including the Ahilyabai Holkar Award from the Maharashtra State Government for its contribution in the field of child upliftment and development (2006-07), the Mayor Award (Mumbai) for the School on Wheels program, the Ashoka Fellows award (2002) and the Lion’s International Award (2010). DSS is also recognised by the Maharashtra State Commission for Protection of Child Rights (MSCPCR). Total Income: The total funds raised in FY13 amounted to Rs63.5mn, almost a 12% increase over the funds raised in FY12 (56.8mn). In fact, the income raised in FY13 was almost 33% higher than the average of Rs48mn of the three prior years. Surplus carried forward from FY13 amounted to Rs9.9mn. 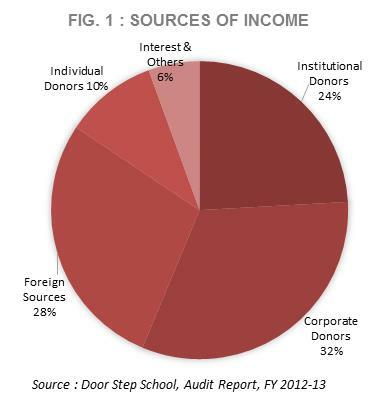 Income from Foreign Sources: Income from foreign sources, the second highest contributor to total income in FY13 (Ref: Fig.1), amounted to Rs18mn, which was about 18% lower than the quantum raised from abroad in FY12. This is mainly owing to the economic downturns faced by these countries in FY13, especially since most foreign donations to DSS come from the USA. Individual Donors: Individual donations amounted to Rs6.5mn in FY13, which was about 20% lower than the amount raised from this source in FY12. However, it is still around 16% higher than the average of the previous three years (Rs5.6mn). Investment Income: DSS generates sizeable interest from investments, amount in FY13 being Rs2.7mn (5% of total income). Program vs. 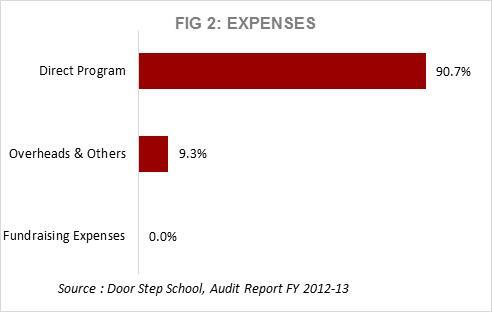 Overhead Expenditure: Prima facie, DSS spends around 91% of its expenditure on program activities, including program salaries. Overheads and other expenses form a little over 9% (Ref: Fig.2) However, it may be noted that the amount spent on administrative staff salaries and travel expenses in any of the years reviewed was not readily available from the books of accounts. The management has informed us that the amount spent on these heads is relatively negligible and therefore won’t skew the ratios materially. We were also informed that no expenses were made exclusively for fundraising purposes. Fixed Assets: Fixed assets held by DSS at the close of FY13 amounted to Rs6.4mn, none of which can be classified as immovable assets. Investments, Cash and Bank: The balance of investments (fixed deposits) at the FY13 year-end was Rs18.4mn, while that in cash and bank balances was Rs21.7mn. Quantum of investments in FY13 was lower than that of FY12 by around 31% whereas the cash and bank balances increased by more than 4.5 times over FY12. Funds – Corpus, General and Earmarked: The corpus fund of DSS is a relatively small amount of Rs3.3mn. General Reserves are more sizeable, amounting to Rs28mn at the end of FY13. Earmarked funds, with an FY13 closing balance of Rs3mn, have been set aside for School on Wheels and other program purposes. Advance Grant: The year-end balance of advance grants amounted to Rs4.6mn. Income Growth Rate (IGR): The IGR for FY13 was almost 12%, which is fairly lower than the average of 17.5% of the years FY11 & FY12. This is perhaps due to the significantly higher IGR of 24.5% witnessed in FY12. The current IGR is acceptable for an NGO the size of DSS, considering no separate fundraising activities are undertaken. Self-Sufficiency Ratio (SSR): The SSR helps measure the ability of an organization to raise funding from steady sources of income such as individual donations, investment income, beneficiary fees, etc. DSS’s SSR for FY13 is 19% which is not very high, indicating a heightened dependence on sources like corporates, institutions and foreign donors, which is more susceptible to Y-o-Y fluctuations. Changing mindsets: Being a program that works directly in the slum communities, one of the biggest challenges remains convincing families in these areas on the necessity of education for their children. This requires a lot of time and patience. Lack of resources: Resources for the program operations are not easy or affordable to come by; there are space constraints for conducting classes, training and for office purposes. Slum areas also lack basic amenities, which adds to the difficulties of conducting classes. There is also a dearth of good human resources, especially at the lower pay scales of an NGO. Fund constraints: Like most NGOs, DSS faces challenges in raising funds year after year. There is always a sense of insecurity with donations, i.e. whether the grants will be renewed in the coming years. Limited Government help: Even after all these years of functioning, DSS still finds it difficult to receive any significant Government support towards the program. DSS is run by mainly experienced individuals from the field of Social Work. Former professor Mrs. Rajani Paranjpe founded DSS along with her ex-student Mrs. Bina Sheth Lashkari. Both are still actively involved in the operations of DSS, and head the Pune and Mumbai branches respectively. DSS is registered with Give India.